Karolina has a strong experience in the fields of requirements engineering, process and quality management. She has international experience in financial sector: she worked for leading financial organizations in South Africa, Netherlands, Austria, Slovakia, Italy and Poland. Between 2011 and 2013 she was an active member of REQB Board and was one of the main authors of IBAQB (IQBBA) certification scheme. She was also the founder and Chief Editor of the C0RE magazine. She is an active member of several organizations acting to increase knowledge and maturity of software testers and requirements engineers. 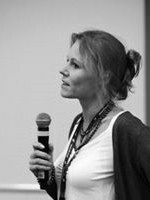 She is an author of many publications in the field of requirements engineering and quality management, including several books..
Karolina currently works as IT consultant, author and trainer in Requirements Engineering and Quality Management fields helping the customers to improve their software processes and products.